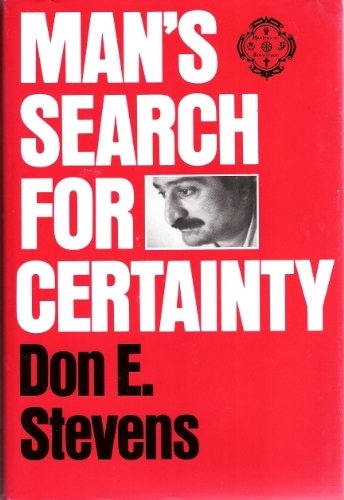 In Man's Search for Certainty Don Stevens points up man's ageless need for security, the unprecedented loss of the basis for it in recent decades, and the manner in which the inner values to sustain it can be re-established as laid out practically for our times by Meher Baba. This is an unusual work in that it offers clear ideas on where the impulse which resulted in the wave of experimentation with psychedelics in the 1960s came from. Equally, it suggests a closely related mechanism which has produced the rancid weed of modern terrorism. Don Stevens has worked for three decades with hundreds of young people attracted to an inner ideal of progress and has been intimately involved, through his close association with Meher Baba, in a great effort to ensure a healthy direction to that idealism. Mysticism, a word often heard and often regarded with vague suspicion, is a key consideration in this work. If Mr Stevens is anywhere near to the truth, it is a key to the resolution of basic ills of our times, and it is Meher Baba who presents the practical methods by which the approach may be incorporated into the life style of modern, technological civilization. Don E. Stevens has contributed prolifically to the literature about Meher Baba. Born in 1919 in Nevada and raised in California, Don attended Johns Hopkins University, graduating with a degree in organic chemistry. Employed in the petroleum industry, Don traveled internationally as the representative of a major American oil company, making his home in London and later in the south of France. His interest in mysticism led to him study under Murshida Rabia Martin, which resulted in his meeting Meher Baba in NYC in 1952. Don thereafter maintained a close relationship with Meher Baba, invited to visit Baba anytime he was within one day's journey. Don was charged by Baba with the responsibility to accomplish the translation of God Speaks and The Discourses into other major world languages. Don also developed numerous long-term, committed study groups in Europe, and remained an invigorating guest speaker at visits to Baba centers around the world.